A few years ago I was living in Rome and ordered a glass of wine on the rooftop of a hotel near the Bocca della Verità. They brought me a white, and it was amazing – crisp, lemon peel, white stone minerality. I asked the waitress to bring me the bottle, and it was a Livio Felluga Sauvignon. Ever since then I’ve been in love with their wines, so I was super excited to get invited on a trip to Friuli to celebrate the 60th anniversary of the winery’s cool map label. The label was created by Livio to portray the then-unknown wine region of Friuli. We got to participate in a scavenger hunt that took us through the locations and grapes that shaped the Felluga journey. 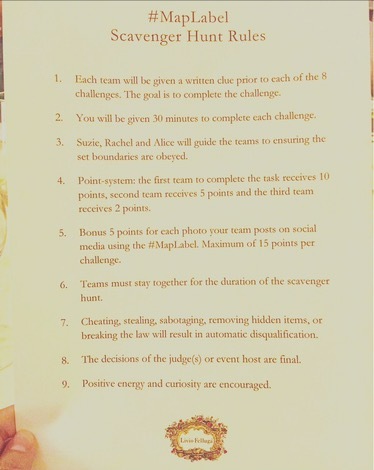 We split into three teams of 3 or 4 somms and writers and got our rules. But first, an aperitif in Trieste with some Friulano of course. Friulano is a native grape of Friuli, and is a perfect aperitivo wine – super light, almondy, crisp and clean. After selecting our team name (Vini Vidi Vici), we were on to the first challenge! We took a boat to the incredibly charming seaside town of Grado and were handed our first clue. We found the binoculars! You could see the route from Istria on the Adriatic. After all that running around, of course a huge pranzo. The second challenge had us all literally racing again, this time through the town of Udine. We had to decipher the clue and then find the osteria that we’d passed on a tour of the town earlier. I remembered it because it looked cute with its little hat above the door and thought it would be a good place to eat. It turned out that the grandfather of the woman who runs the osteria was Livio’s first customer. We saw each team sprinting ahead of us to so knew we lost, but we got to taste through tons of Friulian wines at dinner – lots of light, crisp whites like Malvasia, Friulano, Ribolla Giallo, as well as a light red called Schiopettino (meaning “little gunshot” because it can be sort of flinty) which was one of my faves. Turns out Osteria Al Cappello IS an awesome place for dinner. For the next challenge, it was off to the vineyards! We headed to Abbazia di Rosazzo and saw the ripe Merlot and Refosco hanging from the vines. So ripe, in fact, that they were ready to be picked. By us. I’ve always wanted to try doing harvest, though heard it’s back-breaking work. Now I know first hand. Check out the slight curve on my back, and try doing that as you cut the grapes on every vine! We only did it for about 20 minutes but real harvest workers do it all day long. We didn’t win – but brought in our fair grape share. Best part of doing harvest? The harvest meal! They had a huge, amazing spread waiting for us with a gigantic bottle of Sossò – a delicious blend of the plummy Merlot and more feral Refosco grapes from the vines we’d just cut. This bottle was ’96 though, so those grapes were picked quite a few years before the ones we just cut… I loved how the Refosco gave the velvety Merlot a little wildness, like putting a leather jacket over a ballgown. Hardest part of a large format bottle – pouring it! And these are actual somms. A few of the next challenges got us to the wines themselves. These were Pinot Grigio’s from different producers in the region. It was pretty subjective to choose what Bobby (a master somm on our trip who has a restaurant based on Friulian food and wine) liked best, but it was fun to taste through the wines and see what everyone’s opinions were. For this one, we had to pick which glasses were Sauvignon Blanc, Friulano, and Pinot Bianco – the three grapes that go into the Terre Alte blend (my fave, with rich yellow florals, baked apple, and almond). It was a lot harder than everyone thought but our team won by a drop. We then got to explore the Abbazia di Rosazzo, an old abbey that was founded by a hermit in around 800 AD. It also happens to have some of the best vineyards in the region, so Livio Felluga waited a few decades to finally own and manage them. We spent a lot of time in this beautiful place, and got grilled about its history for the next challenge. The abbey grows over 150 varieties of roses. Inside the abbey, we did a vertical of the Abbazia di Rosazzo wines from 2009-2104. Writing good tasting notes isn’t easy. We had a little fun with ours (the grapefriend way) and described the 2014 as full of jasmine and orange blossom while remaining lean, like someone who’s about to fatten up with a two-risotto lunch. Which is what we were about to do. Andrea Felluga (Livio’s son) and Bobby Stuckey (the somm who owns the restaurant Frasca) had a risotto showdown. Bobby made a great vegetable risotto but Andrea did an apple cinnamon one that was out of this world. I’ve never had sweet risotto but the crunch and acid of the apple was such a great match for the dense risotto. And it went amazing with their elegant honey and apple Pinot Bianco/Chardonnay/Picolit blend Illivio. On to the final challenge! We had to put each Terre Alte wine in age order. All of the teams did ok but a few vintages threw everyone for a loop, thinking they were much older than they actually were which messed up our whole order. Us!!!!!! (With Andrea in the middle.) The name Vini Vidi Vici really paid off. 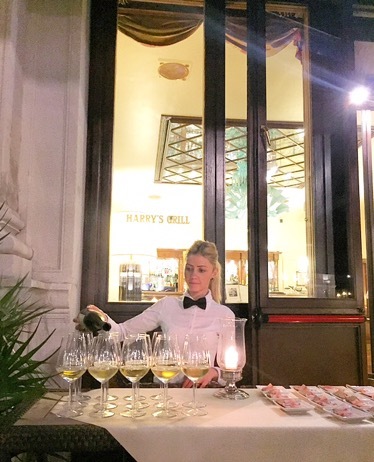 Cheers to a spirited hunt, a super fun trip, and incredible Friuli wines! Tags: friulano, friuli, italy, merlot, picolit, pinot grigio, refosco, sauvignon blanc, wine. Bookmark the permalink. Looks like a Grape Life!! Thanks for sharing. We have some of the Scarpetta wines on our restaurant wine list. The Frico Bianco has been enjoyed by so many of our customers in the summer. Thanks for posting.